Pacific Carlton is an 80-suite retirement residence in the ocean side community of White Rock and offers a level of style and spaciousness that you might not associate with ordinary seniors living. The moment you enter the resort-like lobby, you know you’re in for something special. Soaring ceilings and double-height windows create a light, open feeling, while a palette of soothing tones and warm woods ensures a cosy, relaxed ambiance. From the dining room to the gardens and every stop in between, you’ll discover elegant living that still feels like home. 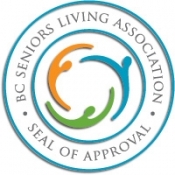 We are proud to have received the BC Seniors Living Association “Seal of Approval”, which designates that Pacific Carlton meets the highest standards of service and integrity. Our exceptionally large and well-equipped suites, extensive array of services and caring staff ensure that all of our independent living and assisted living residents enjoy the very best that life can bring. Step through our doors and discover what Pacific Carlton has to offer you. Pacific Carlton has been viewed 42 times over the past 30 days (3040).